Following the good start to the year, the Volkswagen brand continued its successful development in the second quarter. In the first half of the year, the brand recorded significant increases in sales revenue, operating profit and return on sales. From January to June, sales revenue reached €42.7 billion, 8 percent over the prior-year figure, largely driven by the strong rise in vehicle sales. With 3.12 million vehicles delivered, a new half-yearly record was achieved. After eliminating special items, the operating profit rose by 20 percent to €2.1 billion. The operating return on sales improved to 5.0 percent (compared with 4.5 percent in 2017). In connection with the processing of the diesel crisis, the brand recorded one-off expenses in the amount of €1.6 billion in the first half. The operating profit after special items was therefore €0.5 billion. “The good operating performance in the first half of the year shows that we are making progress step-by-step with the realignment of the Volkswagen brand. Customer demand for our new models continues at a high level. At the same time, we are continuing to exercise cost discipline. We must consistently pursue this path and further accelerate our transformation to raise our earnings power to a really competitive level that is viable for the future in the long term,” said Dr. Arno Antlitz, Member of the Board of Management of the Volkswagen brand responsible for Sales. In the second half of the year, one challenge will be the changeover to the new, more time-consuming type approval procedure WLTP. From the third quarter, the brand expects temporary effects on the operating profit and liquidity as a result of this changeover. Nevertheless, the Brand Board of Management has confirmed its forecast for the year. On this basis, sales revenue is to grow by up to 10 percent and operating return on sales before special items by between 4 and 5 percent. Operating cash flow before special items is to become positive again. In the year to date, one of the main factors driving this positive development has been the successful continuation of the brand’s SUV offensive. 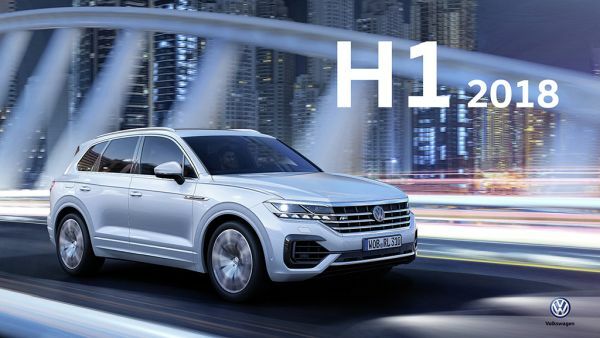 While the Tiguan has become a global bestseller, the second generation of the flagship Touareg1 model was successfully launched in the second quarter. With over 100,000 orders received since its launch in the fourth quarter of last year, the T-Roc is also very popular in Europe. The T-Cross2, recently presented, will be Volkswagen’s next SUV to be launched. Within one year, Volkswagen has boosted the SUV share in worldwide vehicle sales from 13 percent in the first half of 2017 to the present figure of 18 percent. The increase is especially marked in Europe, where the SUV share has risen from 17 to 25 percent in the course of the year. In North America, this share almost quadrupled, growing from 10 to 38 percent. With reference to overall deliveries, Volkswagen recorded a positive development in all the world’s regions in the first half of the year. Both in its domestic market of Germany and in the major automobile markets of Western Europe, China and the USA, the brand boosted deliveries to customers in the mid to high single-digit percentage range. In the growth markets of Russia and Brazil, deliveries by the brand even rose by more than 20 percent. In the first half, the higher share of high-margin SUVs and continuous progress with the turnaround in the regions made a key contribution to the improved earnings situation of the brand. In addition, further productivity improvements were achieved through the pact for the future. Up to the end of 2018, sustained cost savings in the amount of about €2.2 billion are to be realized. Volkswagen aims fur annual savings of €3 billion in Germany as a result of the pact for the future. Additional funds need to be generated for the brand to make the investments required for the transformation to e-mobility and autonomous driving as well as its digital initiatives from its own resources. Adjustment to increasingly tough competition also calls for the successful completion of the pact for the future as well as additional efforts beyond the year 2020. Over the next few months, the Board of Management and the Works Council will therefore be deliberating on further measures and working together to make the Volkswagen brand sustainably competitive and viable for the future.